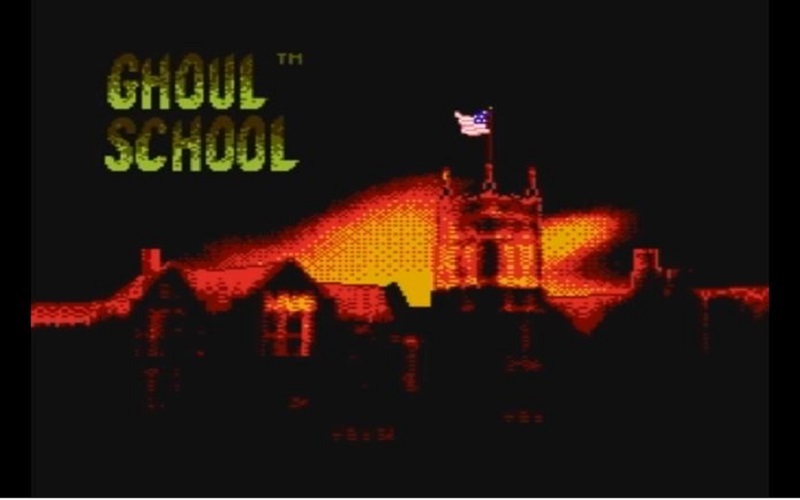 Ghoul School was a 1992 Nintendo Entertainment System (NES) game developed by American studio Imagineer, a division of Absolute Entertainment. Founded in 1986 by a former Activision game designer, Absolute’s initial releases were primarily sports games developed for the Commodore 64 home computer, as well as Atari’s 2600 and 7200 home consoles. Absolute are probably best remembered for the 1989 NES hit, A Boy and His Blob. They also released Star Trek: The Next Generation games for Nintendo’s NES and SNES consoles. The game was published by a then-newly founded studio, Electro Brain. Arguably, Electro Brain’s most memorable releases were Star Soldier: Vanishing Earth and Dual Heroes, both released for the Nintendo 64 in 1997. However, neither game found much of an audience and Electro Brain closed their doors the following year. I, personally, quite enjoyed Star Soldier. Despite starting off without any form of introduction, back story, or any hint towards just what you are supposed to be doing (or where you should be doing it), Ghoul School does feature an actual “plot”. Unfortunately, as the “story” can only be found in the instruction manual that was originally included at purchase (or on the back of the original box), gamers that either rented Ghoul School from their local video store or picked it up second-hand from a used games dealer were presumably left in the dark. 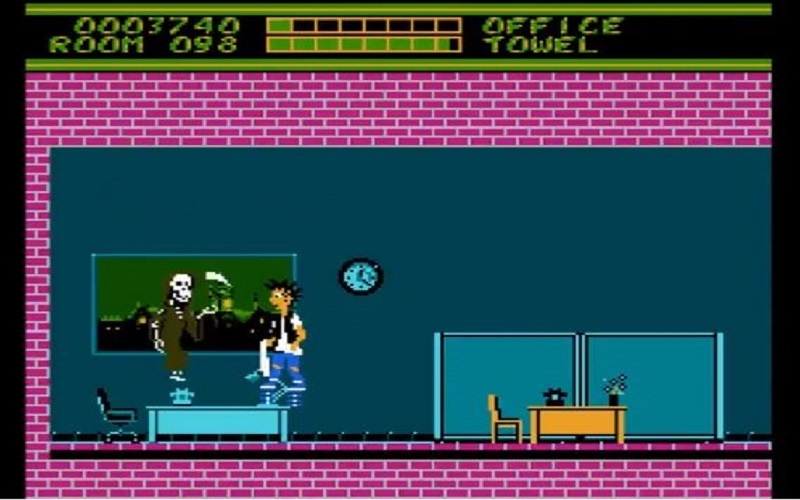 Ghoul School is an early entry in the “Metroidvania” game genre. So early, in fact, that the term had not yet been coined. For those not familiar, a “Metroidvania”-style game is one featuring a large world map, although parts of that map can only be accessed through completing tasks and/or finding items needed to “unlock” other parts of the map. These games usually involve quite a bit of backtracking. The term “Metroidvania” is a mash-up of Metroid and Castlevania, two of the most popular game franchises to frequently feature this gameplay style. Released by a smaller distributor, Ghoul School did not receive nearly the amount of publicity and promotion that “higher-prestige” titles from “major” labels did. It was also released late in the NES’s life-cycle, after the release of Nintendo’s new and improved Super Nintendo console. I would assume that most of the gamers that played the game upon its release rented it from their local Mom and Pop video store, presumably because all of the copies of more popular new releases, such as Super Mario Kart and Mortal Kombat, were already rented out. As I usually made a beeline straight to the video store once school dismissed every Friday afternoon, I was probably the one renting those copies of Mario Kart and Mortal Kombat. Not true. I owned both. Although I’d purchased a used copy of Ghoul School a few years back, I had never played the game until it was time to start this review. Within the first few minutes, I could tell that this game must have been a nightmare for many players back in the day, especially as looking up walkthroughs or maps on the internet was yet to be a “thing”. As gaming magazines of the era generally focused on strategy guides for the most popular releases, I can’t imagine there being many, if any, written for Ghoul School. Gameplay consists of moving Spike through the school’s hallways and stairwells, fighting a series of similar looking monsters, all featuring a single large eye. We’ll call them “Eye Monsters”. As you progress through the halls, you will frequently enter various (usually nearly identical) classrooms and offices. Here, you will fight other creatures, such as bats and a green monster that throws its head at you, while searching for health refills and other items needed to advance your quest. Some items can also be found by smashing the televisions in the classrooms, but unless this fact was mentioned in the game’s manual, I can see some players never having discovered this secret. Spike can hide inside of lockers located throughout the school’s hallways, preventing him from taking damage. However, as most of the enemies do not venture very far from their designated spot, I never found much need to use this approach. The lockers do play into an “invincibility cheat” that can be accessed after finding certain items, but I chose not to exploit this feature. As stated, unless you have Ghoul School’s “instruction manual”, nothing is made clear to you at the start. There’s no hint towards where you need to go or what you need to do. All that’s clear is that you are armed with a short white stick, meant to be a baseball bat. As your initial weapon, the bat deals low damage. The bat also features some sketchy “hit detection”, meaning that your enemy receives no damage when you know damned well that you hit that daemonic sumbitch. As “Spike” also has a mild tendency to “slide” while stopping movement, you’ll be getting hit often and getting frustrated by it just as frequently. While you can move to your left at start, the first enemy that you’ll encounter (a disembodied Gorgon head) is immune to most weapons, and can also kill you with just a single hit. You’re then forced to proceed to your right, down the first hallway. At the end of most hallways, you will either proceed right to the next screen or “hallway”, or find staircases leading up or down to other floors. Some hallways do feature dead ends. Without some form of walkthrough or guide, playing Ghoul School consists of quite a bit of “trial and error”. Rooms and hallways are numbered, which is a godsend to those resilient gamers that draw out their own maps. 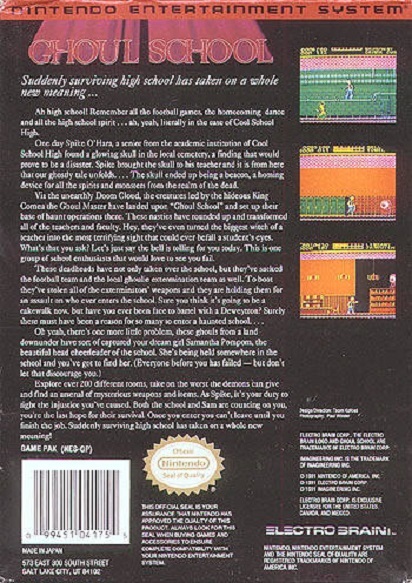 The first move players will want to make is to locate the school’s Physical Education department, where they will find the game’s first two weapon upgrades. The first weapon that you’ll find is a rolled-up towel that you’ll snap at enemies as an attack. The towel has about the same reach as the baseball bat, but somehow does more damage. I guess “shame” costs some HP. Next up is a gun called the Deweytron. The Deweytron shoots a white blob that may as well be dryer lint, especially as it does just about as much damage as actually being hit with dryer lint. The weapon’s only benefit is that it allows you to attack from a safe distance, but damn…. Spike will be in college by the time the target finally dies. Oh, who are we kidding? Spike isn’t going to college. In the same area, you will also find Spring Shoes, the first of the game’s two shoe upgrades. The Spring Shoes, as you should assume from their name, allow Spike to jump over tall obstacles. However, they also make Spike taller, allowing him to be hit by some of the game’s flying monsters. You’ll eventually find a pair of Suction Shoes, which, when used in conjunction with the Spring Shoes, allow you to walk on the ceiling to avoid enemies and traps. That said, the “maneuver” is a little more complicated than it needs be, especially since the Suction Shoes serve no other discernible purpose. It’s worth noting that the P.E. section of the school features enemies and traps befitting of that area. There are locker room showers that spray scalding hot water as you pass, possessed basketballs, and even a barbell-curling Eye Monster who will throw the weights at you if you get too close. However, these little touches seem to become less evident as the game progresses, almost as if the developers assumed that no one would play that far. And really, I can see why they make that assumption. From the locker room, you’ll venture your way to other parts of the school, such as the cafeteria, chemistry lab, and even the air conditioning ducts. As you progress, you’ll find even more weapon upgrades, including a devastatingly powerful sandwich weapon. However, most of these weapons will only be useful in one or two specific battles. Most of Ghoul School‘s “creatures” are the various sized Eye Monsters. However, you’ll eventually come across other enemies such as wrench throwing monkeys, a large green alien, and even a “special needs” Grim Reaper. Well, he looks “special needs”, at least. Sadly, the majority of these other enemy types are usually consigned to a specific room or hallway. The numbering system used for the school’s myriad of rooms and hallways can get more than a little confusing, and the fact that only a few of the halls feature their own unique color scheme doesn’t help make finding your way around any easier. Yet, the game’s most infuriating flaw comes in the form of Spike’s limited jumping ability. While the only enemy that you’ll frequently need to jump over is the smaller, faster version of the Eye Monsters, Spike’s inability to crouch and attack (or to even crouch at all) makes dealing with these lil’ bastards more of a headache than it rightfully should be. While the Spring Shoes do indeed increase the height of Spike’s jumping ability, they do nothing for distance, thus making them almost just as ineffective. Any monsters that have been defeated do not respawn until the player has lost all of their remaining “lives”. Upon losing all of their “lives”, players will restart at the entrance of the school, but will keep any upgrades that had previously been found. The game concludes with an obligatory boss battle. However, Ghoul School is content to “phone it in” and throws out yet another Eye Monster, albeit one that’s much larger and shooting lasers from its eye. Defeating this enemy is really quite simple, especially since you can stand in one specific spot and not be hit by an attack. Upon defeating this creature, Spike rescues the fair Samantha…. only to have his heroic efforts go all for naught when Samantha rejects his affections, leaving the player to wonder why they just spent a couple of hours even playing this nonsense. Overall, Ghoul School is not a very well made game. What could have been a promising adventure is quickly buried by what can only be described as lazy game design. Ghoul School just doesn’t have enough interesting aspects going for it to be much of a recommendation. Fans of obscure games may want to seek it out just as an oddity to add to their collections, but casual (retro) gamers should take a “skip day”. I love the amount of detail you go into for such an insignificant title. It’s why I always look forward to your posts. Thanks for saying that. I worried that I went about 700 words too far into detail.